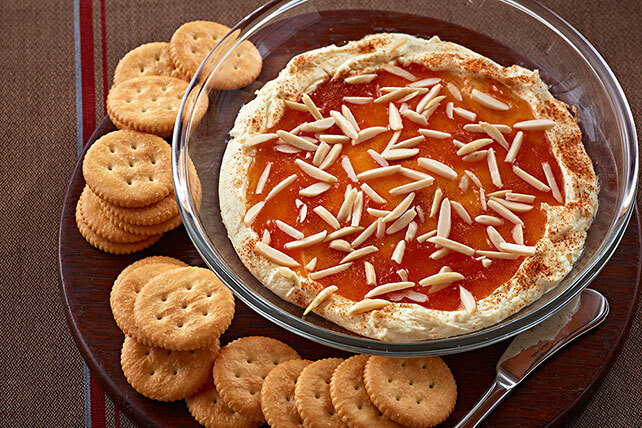 A hint of sweetness and kick of spice make this delicious spread a surefire party pleaser! And only you will know it took just minutes to prepare. Spread cream cheese onto bottom of microwaveable 9-inch pie plate. Top with jam, pepper and nuts. Microwave on HIGH 1 min. or until heated through. Serve with the crackers. Good news! You'll save 50 calories and 5 g of total fat, including 2.5 g of saturated fat, per serving by preparing with PHILADELPHIA Neufchatel Cheese, sugar-free apricot preserves and RITZ Reduced Fat Crackers. Substitute orange marmalade for the apricot jam.